Move the sliders and watch how changing the numbers changes our product. Here we are working with a tool that lets us compare the different parts of scientific notation. We are able to use the sliders to change our coefficient value (a) and our exponent value (b). When moving these we are not only able to see how the Scientific Notation form changes but also how the number changes in standard form. 2) Now that you have the hang of the sliders set b=7. Move the "a" slider to different points around 1.9, ﻿3.4, and 9.6. How does changing the coefficient (a) effect our number? 3) Move slider "a" to 4.8. Now play around with slider b, set it to numbers around -4, 1, 2, 6. 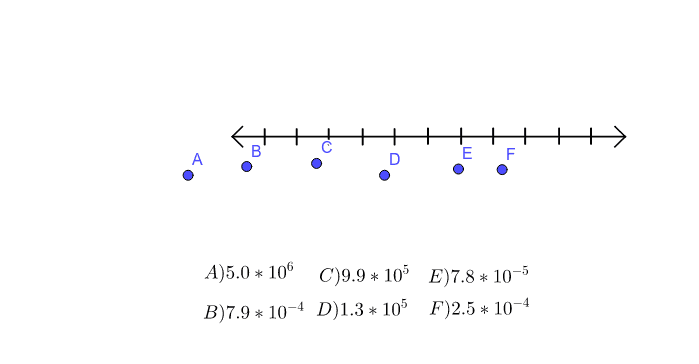 How does changing the exponent, "b", effect our number? increasing the exponent by 1 (Going from 6.0 x 103 to 6.0 x 104)? Key Question: Therefore when looking at which number in scientific notation is larger or smaller which should we look at first, the coefficient or the exponent? 7) Lets try it! Place the numbers in order from least to greatest on the number line. 8) Let's do some more comparisons! Chance the Rapper has about 6, 792,000 followers on Instagram while Katy Perry has 6.8 x 107 followers on Instagram. Who has more followers? Hint: What do we have to do first to compare the numbers? Key Question: So when we are comparing numbers that are in different forms, scientific and standard what do we need to do first? 9) Recently there was a Facebook poll that showed how many people were fans of the different NFL teams. About 2, 500,000 fans said the liked the Packers, about 3.27 x 105 were Bills fans, and 1.95 x 106 people said they liked the Giants. According to the poll which team has the most fans, which team has the least? 10) The average diameter of a type of round shaped bacteria is 0.0000037 meter. The spacing between the two of these bacteria is 2.1 x 10-6 meters. Which length is smaller?